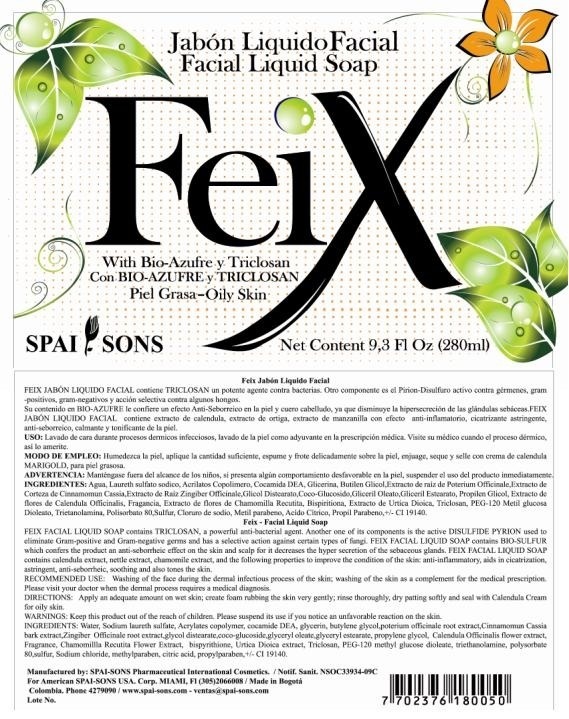 Feix Facial Liquid soap contains TRICLOSAN, a powerful antibacterial agent. Another one of its components is the active DIPYRITHIONE and BIO-SULFUR used to eliminate Gram positive and Gram negative germs and has a selective action against certain types of fungi. Facial soap used in persons with oily skin. Apply an adequate amount on wet skin; create foam rubbing the skin very gently; rinse thoroughly, dry patting softly and seal with Calendula Cream for oily skin. Contains calendula extract, nettle extract, chamomile extract, and following propierties to improve the condition of the skin: anti-inflamatory, aids in cicatrization, astringent, anti-seborrheic, soothing and also tones the skin.